NORWAY: It’s shocking to many, but in 2012, the Bible was the number one selling book in Norway and continues to do well in 2013. Norway is considered one of the world’s most secular nations. It has a population of 5 million people and only about 50,000 people (1%) regularly attend church. In 2011, Norway’s Bible Society (NBS) released a new version of the Bible called The Scriptures, replacing a version introduced 33 years earlier. Written in Norwegian, The Scriptures is more readable and accurate than the old. People are still trying to understand why The Scriptures suddenly became so popular in this very secular nation? Last year, it sold nearly 160,000 copies surpassing even 50 Shades of Grey. Some attribute the Bible’s success to a slick advertising campaign geared to the youth, while a NBS spokesman wondered if increased immigration may have in an odd way played a role. Many new immigrants are arriving with strong religious beliefs and this may have sparked renewed interest among Norwegians in their own religion. Curiously, another significant spiritual event took place in Norway in 2012 and I wonder if this was a catalyst to the renewed Bible interest. For 1,000 years, the Church of Norway (Lutheran) has been the official religion of Norway. The government even had a cabinet post — minister of religion — who oversaw the church and appointed Bishops and Deans (Bishop assistants). 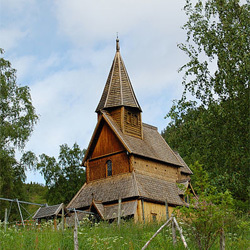 In May 2012, the government officially ended the Church of Norway’s status as the country’s official religion. With this change, Norwegians were suddenly responsible for their own faith. There has even been talk this renewed interest might be a prelude to a spiritual awakening in Norway. The LORD has always had a remnant. My Norwegian grandparents definitely passed down the importance of the Bible. In 2011, at a 100 year celebration of a Canadian country Lutheran church, the original Norwegian Bible used by their first Pastor was given back to the congregation. How prophetic was that act regarding the Word of God (Bible) being restored to the people!